Aluminum anodizing, whether it is type II or type III, is achieved by electro-chemical methods prescribed and designed to yield oxide coatings with certain properties. These properties can be hardness, thickness, electrical resistance, corrosion resistance, bond-ability, lubricity, and/or combinations of several of the above. One common, desirable output of aluminum anodizing is the ability to obtain color on the part—for both type II or type III. When anodizing colors, there is a distinction between color range versus color match. Let’s explore the variables that are behind this. 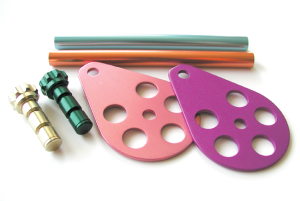 You may have heard that the most common method of color anodizing is achieved by submersing anodized parts into a dye bath to create the color. The dye absorbs into the open pores that are created during the anodic coating process and then they are sealed to help keep the color in for as long as possible. However, even if the dye is the hue you want to achieve, there are many variables that can affect the outcome of the final product. Even under the tightest of anodize controls and the strictest chemistry ranges, these variables can cause enough differences to make exact color matching a nightmare. Truth is, anodizers face complex issues when attempting color match and repeatability. This is why “color range” is so important when deciding what is acceptable and what can be achieved repeatedly. Remember, color is achieved by dye absorption, and since it is being accomplished while “underwater,” where it can’t be seen, it is impossible to hit an exact match every time. Given the many variables such as alloy, type of anodic coating, rate of dye absorption, pore size, coating thickness, and color displacement during sealing, to name just a few, anodize color repeatability is understandably difficult. One more fact to consider when anodizing colors: the “color” is not achieved by applying a pre-mix solution that lies on an object that it contacts and then dries, such as paint. Rather, it is the result of a combination of chemical steps designed and controlled to give performance attributes and allow the best chance of color success. The hard facts are that good color matching and repeatability are directly connected to tight control of all possible variables, full understanding of how these variables interact and affect the end color, and an educated customer who understands that desired performance criteria such as, hardness, thickness, type of anodizing requested, etc. may be in conflict with achieving the desired color. Ask us about how we can best deliver an acceptable and consistent color to you through our color anodizing. At DCHN, we know that many questions arise when considering aluminum anodizing, hardcoat, and other metal finishing jobs. Our white paper, “12 Proven Tips to Save Time & Money for Aluminum Anodizing, Hardcoat, and Other Metal Finishing Services,” is a guide full of great tips to help you save time and money.